Yeah! Another cheap, simple prop that can be used in a variety of ways. All you’ll need are cheap, white paper plates. Put two plates together and staple about ¾ of the way around. Leave an opening large enough so you can stick your hand in and use like a puppet. Write letters, numerals, shapes, math signs, etc. on the plates and use to really involve your students. *Write the letters “B-I-N-G-O” on the front of the plates as shown. Cut out hands and write numerals on the back. Choose five children to wear the letters as you sing “Bingo.” Explain that “Bingo” is a word that has five letters. After each verse you will turn over one letter and they should clap instead of saying the letter. Children will learn to go from left to right; they’ll learn that letters make words; they’ll learn number concepts. *Give each child a letter to wear. Have them come to the front of the room as you call out their sound. Put the letters together to make words. This can reinforce CVC words, word families, silent “e,” etc. 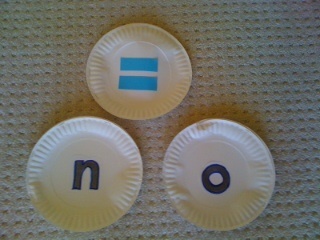 *Write numerals on plates and use for ordinals, number sentences, “Ten in the Bed,” and other numeral songs and finger plays.